Trembling, I dig my boots into the mud. A monstrous black police dog named Cade barks and lunges, flecks of foam flying from his jaws. In seconds he will be released – so he can attack me. His handler, an RCMP constable, has told me all I need to know: Stay on your feet. Protect your face. In this tableau of terror, I am completely and entirely present. “Come out, bad guy, or I’m sending my dog!” he shouts from 20 feet away. My voice is quaking. And then Cade hurtles through the air, snuffing out all thought. It no longer matters that my relationship of 20 years and three children is falling apart, that my career as a writer has stalled, that on top of this I doubt myself as a mother. None of this matters. Cade is upon me. There is a script for what you are supposed to do when a relationship is in trouble: You go to couples’ therapy. You talk about your issues. You try to find compromises and resolutions. You listen attentively to your partner. You are invited to do awkward hugging exercises. We did all that, sitting in the office of a therapist I privately called Dr. Doom. We made a tremendous effort, because, painful as it was, it was the only script we knew, and everything we had built together was crumbling. Now I’d found another script. Traditional couples’ therapy offered me no relief. But going to the dogs did. 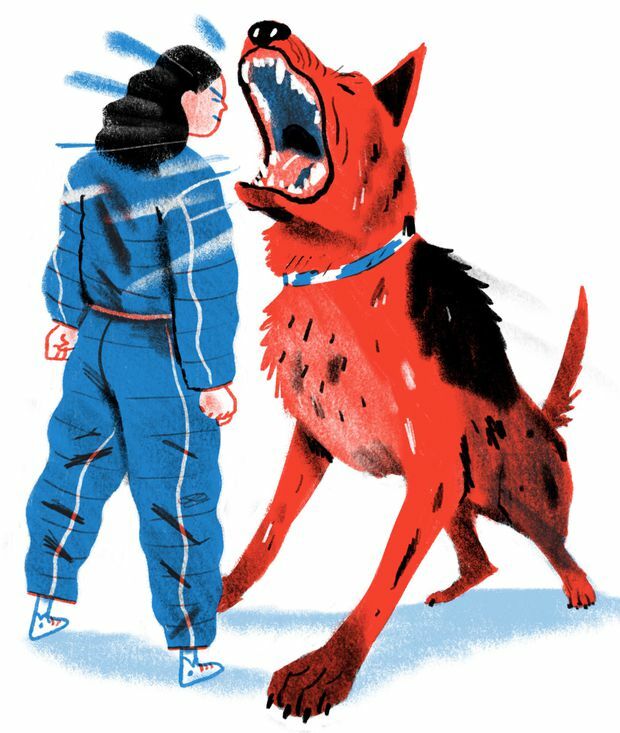 In the course of writing The Dog Lover Unit: Lessons in Courage from the World’s K9 Cops, I have been attacked by dogs in four different countries. Every time I stood my ground while a dog charged me, something in me was cut loose. It was like I’d invented some novel kind of therapy – K9 shock therapy. In Paris, I was bowled over by Maxou, a rescue K9 who punched me to the ground with his steel-embedded muzzle. In Innisfail, Alta., I ran after young dogs and their handlers-in-training, finding endurance I didn’t know I possessed. In Santa Rosa, Calif., I spent a day in jail working with Sasha, a dedicated drug-detection dog. In London, I watched a shepherd named Sampson doing human-blood-detection work. I had become desperately sad. I loved my family so much, but my world had become small, and poetry no longer sustained me. I thought maybe we could all just run away together and everything would be better – a geographic cure. The only thing that stopped me was nobody else in my family of five had the slightest interest. My partner, Isabelle, is a doctor for the police, a stressful job that she finds deeply satisfying. It was an offhand comment she made about police dogs that sent me on my quest: to slip away from my family, at least for a little while, to research my book. I was worried that I wasn’t the right person to be riding along with these badass cops and their fierce dogs. What the heck would we even talk about? I need not have worried. The police officers I rode with were natural storytellers. All I had to do was ask a few questions, and the hours flew by, interspersed with dog training and the occasional high-speed chase. I came home from these night shifts dead tired, but on the road, I felt alive in a way I hadn’t felt in years. It took everything I had to keep up, every ounce of courage I possessed to sit shotgun as we raced, sirens screaming, to whatever fate awaited us. In the end, I found freedom in the pure animal company of the dogs. I delighted in throwing balls for them to grab out of the air at midnight under star-studded skies. My heart swelled, feeling their breath on my neck, their trumpeting barks in my ears, as we raced through crowded city streets or eerie rural forests. In the presence of these magnificent dogs, I got out of my own head and tasted courage. I saw dogs that had paid a terrible price to protect the lives of their handlers or innocent civilians. I met dogs that had been beaten, choked and even bitten by suspects. I also came to see some of the toughest men and women in policing in a different light. The officers I spent time with did not let setbacks define them. They saw obstacles as problems they were capable of solving. They embodied perseverance and grit. It was exactly the company I needed to keep at the time. When a dog is hurt, it retreats to a private place to recover. For some of us, this is a more appropriate model than to invite a stranger to shine light on our wounds. Sometimes when hearts are injured, they can’t bear the weight of a stranger’s scrutiny. Sometimes both halves of the couple need to attend to themselves in private. I have come to think that many – perhaps most – long marriages go through such a process of destruction and reconstruction. I also have come to realize that there is no greater intimacy than the deep marriage-within-a-marriage that my partner and I now have. Coming through this breakup and transformation inspired us to get legally married. After our vows and kiss, all of us leaned in, laughing, for a group high-five. It is a moment fixed in time for me: our sons, serious and handsome in their suits, the dog, snuggled in our daughter’s arms, and my wife’s eyes, tender with love and bright with tears. There is no script guaranteed to fix a relationship. Maybe all we can do is try to fix ourselves. Sometimes we just need to go to the dogs. Rachel Rose lives in Vancouver.